that is one fancy peppermint stick... or wheel I should say! I love how some of the photo is in focus, while other parts are not. Neat Photo! Love the peppermint lights! Looks like those peppermint candies called starlights that they give away in restaurants! Beautiful! The red really pops. Great drama with the red and white against the black! Gorgeous photo! 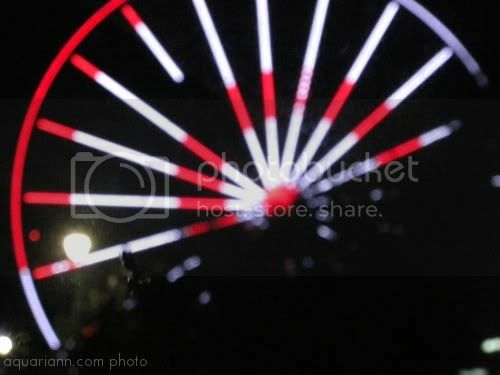 It would be so fantastic to live somewhere that has a Ferris wheel locally! Awesome photo! I love it! Gorgeous photo! Thanks for sharing, & have a minty WW, a Merry Christmas, & a Happy New Year! It does look like peppermint! That is quite lovely and unique. Thanks for sharing.